Reconnect with the part of you that enjoys cool, fruity drinks in a chill environment among hip people. In 20 Weeks of Tiki Drinks, you are invited to explore the island oasis that is the Forbidden Island Tiki Lounge. Each Tuesday features a different imbibement, often a medley of classic drinks like Mai Tais and Trader Vics with modern twists. 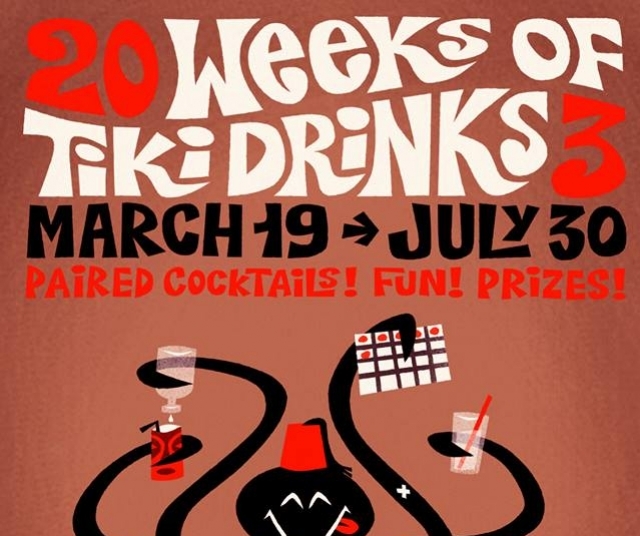 The event combines innovation with competition, as participants of the 20-day challenge are encouraged to keep track of their progress through tiki samplings with punch cards. Those who complete their journeys will be able to win a one-of-a-kind tiki mug created by Woody Miller, a local artist. Additionally, thanks to producers Otto and Baby-Doe von Stromheim, Tiki Oasis 2019 packages will be offered. A Premium Cocktail Pass will even be attainable. You can find our about the largest and longest-running festival in the world for lovers of Island lifestyle and purveyors of Polynesian Pop here. If you can't make the event, we at Hawthorn Suites Alameda still strongly recommend you check out the Forbidden Island. Located a 15-minute walk from the hotel (go down Pacific Avenue until you hit Sherman Street, then take a right), the bar and lounge never fail to impress with its groovy music and multi-colored lighting. The relaxed and vacation-y ambience is only further enhanced by the indoor fountain gurgling in the corner. If you like to understand your drinking buddies without having to lip read, this is the spot for you! Upcoming events include the 13th Anniversary Celebration Party and shows like Copycat "Summer of Love" with DJ Xerox (NYC) and Drums a Go-Go with DJ Tanoa. Happy hours are Tuesday through Friday from 5-7 PM. To check out their full calendar, click here. If you want to learn more about the lounge, you can check out their website here. You can also call them at (510) 749-0332. Hours are Monday through Thursday from 5 PM-12 AM, Friday through Saturday from 5 PM-2 AM, and Sundays 3 PM-10 PM. It goes without saying that this event and all other events at Forbidden Island are strictly 21+.